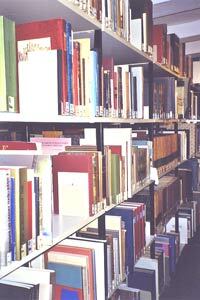 The Institute’s library and associated collection are a unique asset in Germany and Europe. In Germany there is no academic institution such as a chair of castellology; the Deutsche Burgenvereinigung (DBV), a private association, fills this tangible need. So despite the considerable financial risk the DBV is serious in its commitment to make possible fundamental research for the conservation of mediaeval and early modern secular architecture. The DBV calls on all those with responsibilities in this field to support it in this task. The library is open to anyone researching or working on academic and scientific aspects of the subject of castles and fortifications, their (architectural) history and conservation, and also to anyone who is just interested in castles. The collection includes literature on castles and also numerous books from related subjects such as gardening, geography, conservation in general, genealogy, children’s literature and much more. But there is more to the Institute than just books. Those who do not wish to browse the library in person can also telephone or write in with their questions or requests. This service is free to DBV members , others can expect to pay 10 to 15 euros for their searches (including the cost of copying). Don’t hesitate to ask if you want information on a specific castle or subject – we’ll be only too pleased to help!